June has been a busy month for our Parent Teacher Association, with both the Summer Fete and the Roaring Twenties Summer Ball taking place, which have raised in excess of £5000 between them. 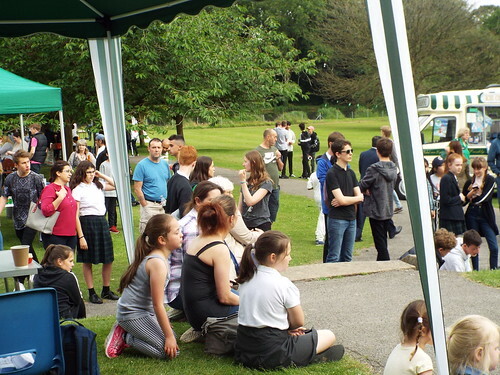 The Summer Fete took place on Friday 15 June. It was a thoroughly enjoyable afternoon, helped by the sunshine. The Pimms flowed, the band played and Mr Hilliam? Well, he got wet! Thank you to everyone who came along and supported the Fete, and to the pupils and staff who devised so many games stalls – a particular favourite being the Chocolate Wheel which always had a queue at it, until the chocolate ran out. And an extended thank you to all those who helped out before, during and after. With your help we raised an incredible £2600. On Saturday 30 June the Summer Ball took place in the Sir Michael Bishop Hall which was transformed into a Roaring 1920s speak-eezy. Greeted with a reception drink on arrival, guests were entertained by live music and had an opportunity to bid for fantastic showcase pieces of sports and film memorabilia in the auction, which included a super Les Paul guitar kindly donated by parent Tony Miln. The guitar alone raised a staggering £350. Thank you to everyone who supported the event, which has raised £2500. And a special big thank you to the support provided by J D Parties and its suppliers who donated a variety of services and products, which contributed substantially to the success of the Ball. Thank you to those who donated a prize.